A group of British boys attempt to govern themselves on an uninhabited island in Lord of the Flies. 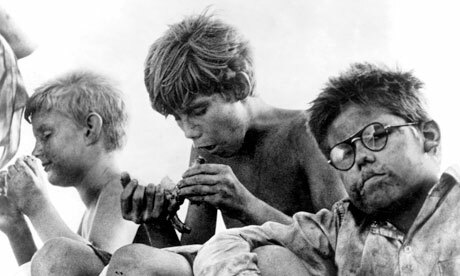 The 1963 adventure-drama Lord of the Flies is the first film adaptation of Nobel Prize-winning English author William Golding’s 1954 debut novel . In the hands of the renowned experimental theater director Peter Brook, Golding’s legendary novel on the primitivism lurking beneath civilization becomes a film as raw and ragged as the lost boys at its center. The novel famously concerns a group of British boys stuck on an uninhabited island who try to govern themselves with disastrous results, marking the end of the children’s innocence…and then some. Taking an innovative documentary-like approach, Brook shot Lord of the Flies with an off-the-cuff naturalism, seeming to record a spontaneous eruption of its characters’ ids. The resulting masterwork earned Brook a nomination for the Golden Palm at the 1963 Cannes Film Festival. Criterion previously issued Lord of the Flies on DVD back in 2000, but now re-issues it on standard DVD along with giving the film its Blu-ray debut.